Secretary of State William Galvin smiles as he poses for portraits with preservation award winners at the Massachusetts Archives Building in Dorchester in May 2013. It’s actually encouraging that Bill Galvin cares about Dan Rivera’s endorsement. We learned this week that Galvin, the secretary of state, and Rivera, the mayor of Lawrence, had exchanged words — some profane — after Rivera endorsed Boston City Councilor Josh Zakim, Galvin’s primary opponent. 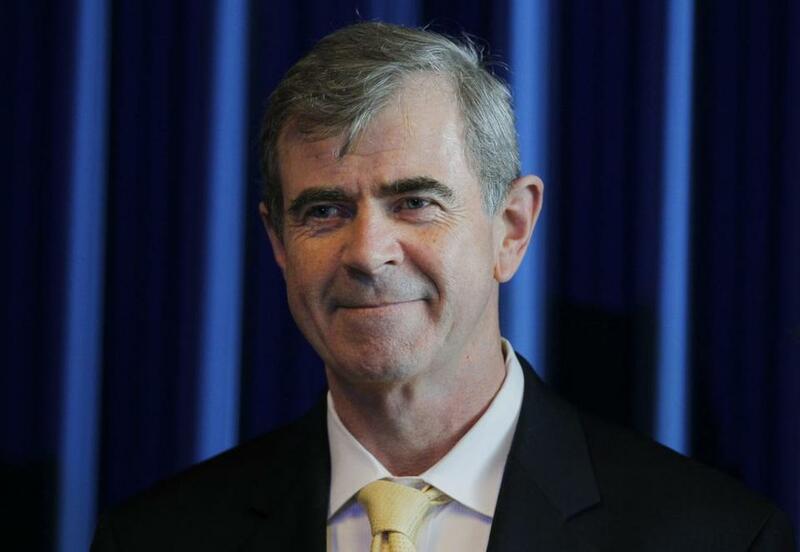 In his 24 years as secretary of state, Galvin had faced only one primary challenger, back in 2006. But this year, a bunch of incumbents are facing folks who have decided against waiting their turn, and are pushing for younger and more diverse representation. Politicians whose reelections seemed foregone, and largely uncontested, conclusions in previous cycles are now having to argue their case. That’s a healthy thing, both for the Commonwealth and for democracy. An incumbent on his or her toes works harder, and more innovatively, for the voters. Zakim’s challenge is healthy, too. The secretary should answer for the fact that other states make it easier to vote, and to access public records, than Massachusetts does. Maybe voters will decide he’s still the guy for the job. Maybe they’ll take a chance on somebody new. Which brings us to that call. According to Rivera, who falls squarely into the second camp, Galvin’s call was all about an old-school incumbent’s sense of entitlement. He says Galvin called him out of the blue to upbraid him for endorsing Zakim. He also says Galvin told him he had helped make him mayor by ensuring that the voting in Lawrence — previously beset by irregularities — had been fair. Rivera took that to mean Galvin was saying the mayor owed him. If Rivera’s account is accurate, this is pretty appalling behavior by the secretary. For the Commonwealth’s chief elections officer to expect a political endorsement in return for doing his job is inexcusable, and a pretty good argument for turning him out. But Galvin says Rivera’s account is not accurate. He says Rivera had promised to endorse him at an event in January, and that’s why he called — to ask for an explanation for the mayor’s apparent change of heart. Rivera vehemently denied promising to endorse Galvin: He merely wished him good luck at the January event, he said. Galvin doesn’t deny ticking off the ways in which his work in Lawrence helped Rivera become mayor. He wasn’t demanding loyalty in return, Galvin maintained, but was merely responding to Rivera’s criticisms. That would have been a smart move. Rivera, and Zakim, believe this was an aggressive demand for loyalty by Galvin, and that it should be disqualifying. “It’s wildly inappropriate for anyone to have a conversation like that, but for a chief elections officer to insinuate that he influenced an election, it’s something you would never see me doing,” Zakim said. Galvin accused Zakim of mischaracterizing the Rivera call, and of using the dispute to raise his own profile. And he bristles at the notion that he’s entitled: He says he’s been working hard to win votes, speaking to people all over the state since long before Zakim announced his candidacy. “I’m even talking to people I should have been smart enough not to talk to,” he joked, referring to Rivera. An incumbent on the defensive. Now there’s a thing of beauty.